Welcome to this year's China Forum. The past 12 months have seen a significant strengthening of China-UK relations and a more productive partnership between us. I have brought with me a set of photos that captured some momentous events over the past 12 months and the new progress in China-UK relations. In the past 12 months, Chinese and British premiers exchanged visits. 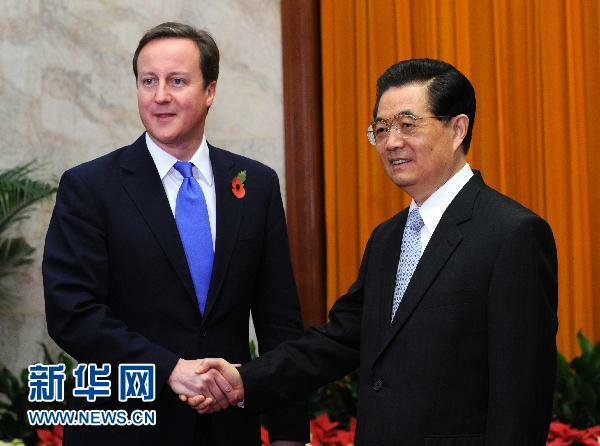 This is last November when Prime Minister David Cameron met with President Hu Jintao. This was Prime Minister Cameron on his first visit to China as prime minister. 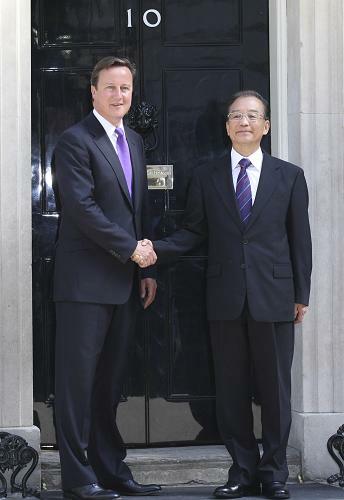 This past June, Premier Wen Jiabao paid an official visit to Britain and called on Prime Minister Cameron at No.10 Downing Street. 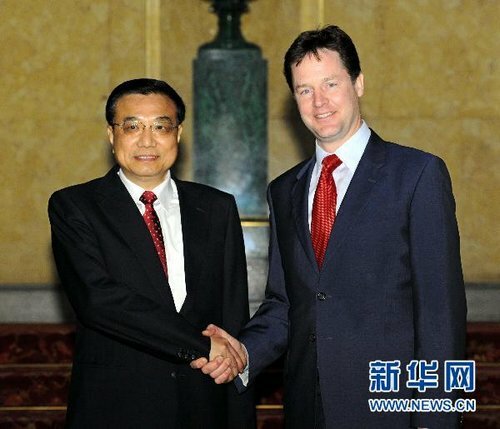 Earlier this year, Vice Premier Li Keqiang visited Britain and met with British leaders including Deputy Prime Minister Nick Clegg. 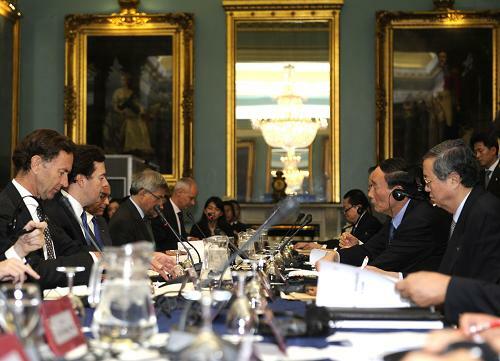 In September, Vice Premier Wang Qishan and Chancellor George Osborne co-chaired the 4th China-UK Economic and Financial Dialogue in London. 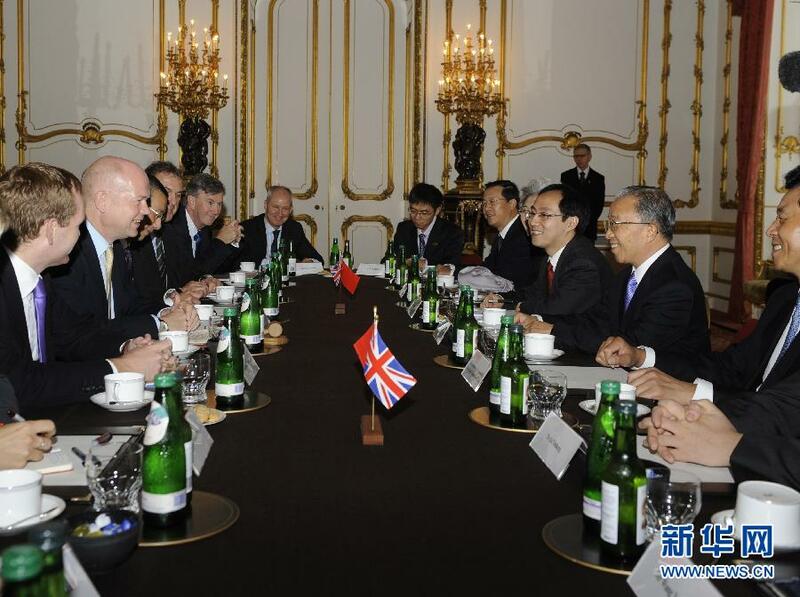 Last week, State Councilor Dai Bingguo and Foreign Secretary William Hague co-hosted the China-UK Strategic Dialogue in Britain. I believe that the past 12 months demonstrate a very positive trend in Sino-UK relations. Our two countries maintain intensive high-level visits and meetings. The result of this progression is that we are benefiting from ever more frequent dialogue and consultations at all levels. These close engagements are a telling measure of the willingness on both sides to strengthen our relationship. Looking forward, both our countries are committed to enhance these wide-ranging exchanges and cooperation. 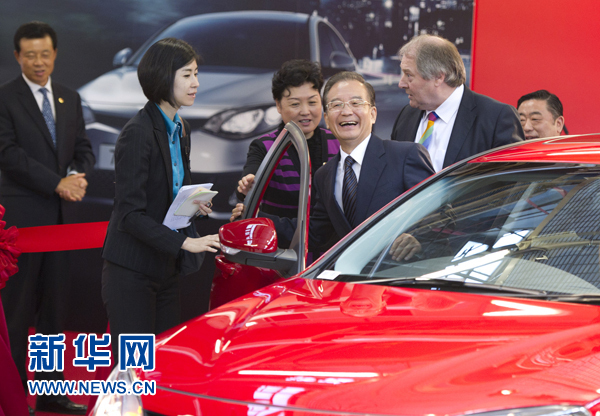 This image is when Premier Wen Jiabao was test driving the first MG6 Magnette that rolled off the assembly line at Longbridge. 'Designed in Britain, Produced in China, and Assembled in Britain'. 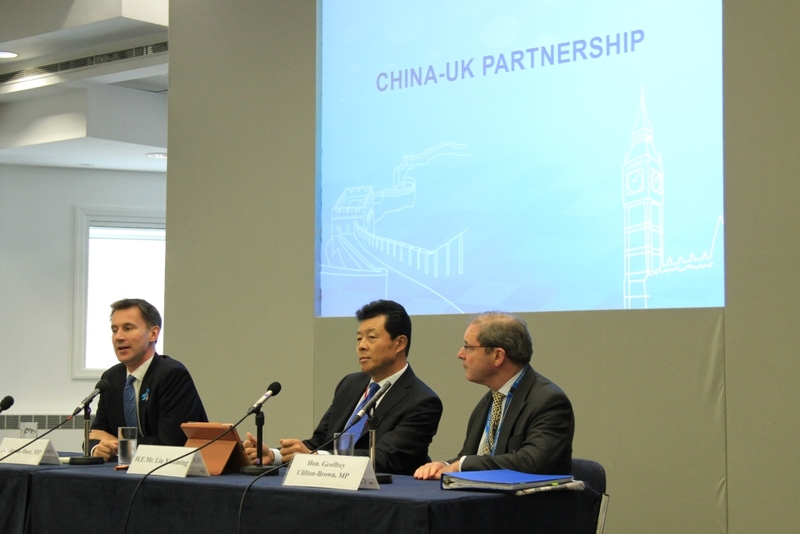 This shows that China-UK commercial cooperation has enormous potential. Furthermore China and Britain can leverage their respective strengths in finance, technology, human resources and creativity. This can open the way for more productive cooperation. The MG6 example is just one of many success stories. Together these are pushing our two-way trade up. In the first 8 months of this year, our bilateral trade rose 18.6 percent to $US 36.8 billion dollars. Over the same period, British exports to China continued to grow strongly. These jumped 28.6 percent year-on-year. That's faster than any of Britain's top 15 export markets. Meanwhile, bilateral investment cooperation continues to be greeted with great enthusiasm. Investment has expanded and diversified into more areas. China today has become Britain's sixth largest investor by the number of projects. 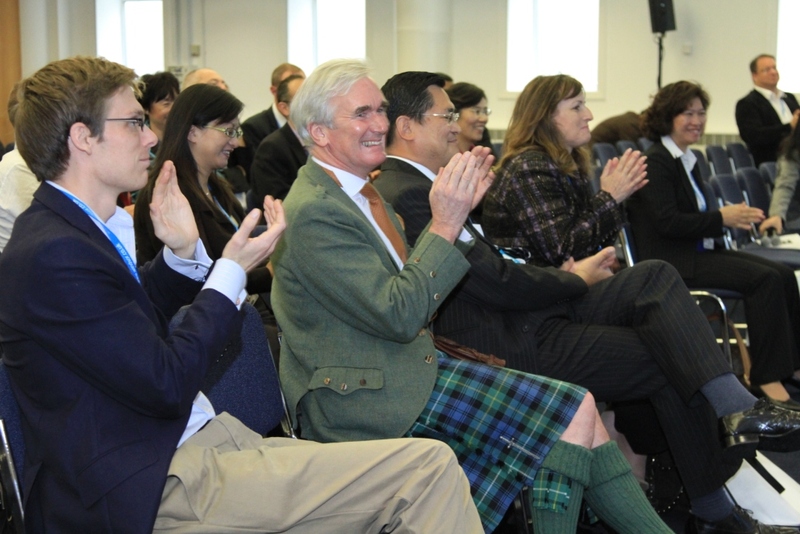 But Sino-UK exchanges reach far beyond trade and investment. This is a photo of The Revenge of Prince Zi Dan at the recent Edinburgh International Festival. 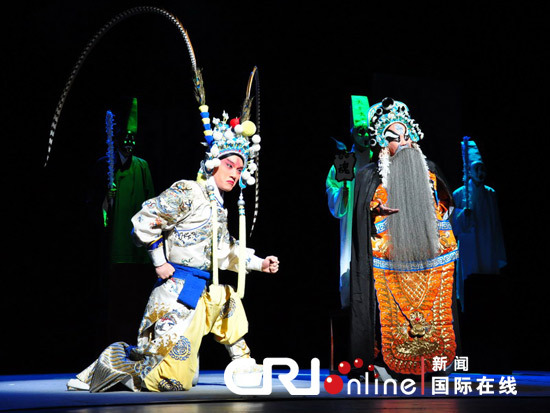 It's a Chinese Peking Opera version of Hamlet. Equally striking is this balletic image from this year's Edinburgh International Festival. 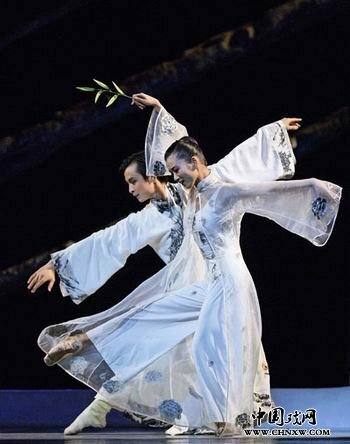 This highly popular dance performance was an interpretation of the classic Chinese romance called The Peony Pavilion. Some of you may know, this play was written by the famous Chinese playwright Tang Xianzu, who was a contemporary of your William Shakespeare. Our cultural exchanges are expanding in both range and reach. This is a good way to enrich the lives of all our citizens. It is a path through which we can build ever deeper understanding of our two countries. I believe the most important way to build appreciation of our two respective cultures is through travel. Nothing can beat the experience of visiting each others countries. According to The Daily Telegraph, Chinese tourist arrivals in Britain in 2010 were up 50% on the previous year. At the same time, 120,000 Chinese students are being educated in the UK. This is by far the highest proportion of any European country. A rapidly increasing number of British young people are now very keen to learn Mandarin. A measure of their success and enthusiasm is with the annual 'Chinese Bridge Proficiency Competition'. I am delighted to tell you that this year the British team gave their best performance so far. At the centre of this picture is one of the British team called Peter Dolby. 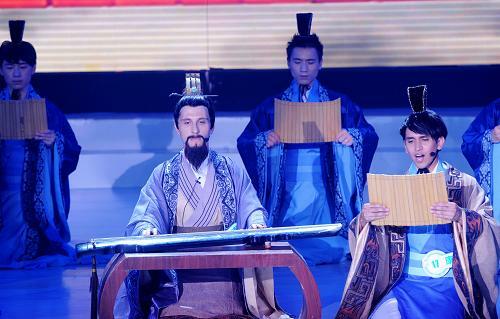 He played the role of Confucius in the finals of the competition and was awarded the first prize. As you will know, later this year China will be sending to Britain two giant pandas as part of a joint research programme. These pandas are excellent symbols of our deepening relations. I like to describe them as 'Friendship Ambassadors' or VIPs - Very Important Pandas! So far I have mostly been reflecting on the past progress of our relations. I am sure you will agree that it is also important to look forward. If we are to maintain the positive progress we need to chart a clear path for the future. I believe that to take our relations forward, it is essential to take the following steps. First, we must work even harder to expand common interests. There's much eagerness in both China and Britain to build a stronger relationship. And we are well positioned to boost our cooperation. What's important now is to match our ambition with concrete steps and produce real outcomes. Our two premiers have made a commitment for raising bilateral trade to a $US 100 billion dollars by 2015. Both countries are committed to making it easier for businesses to trade. 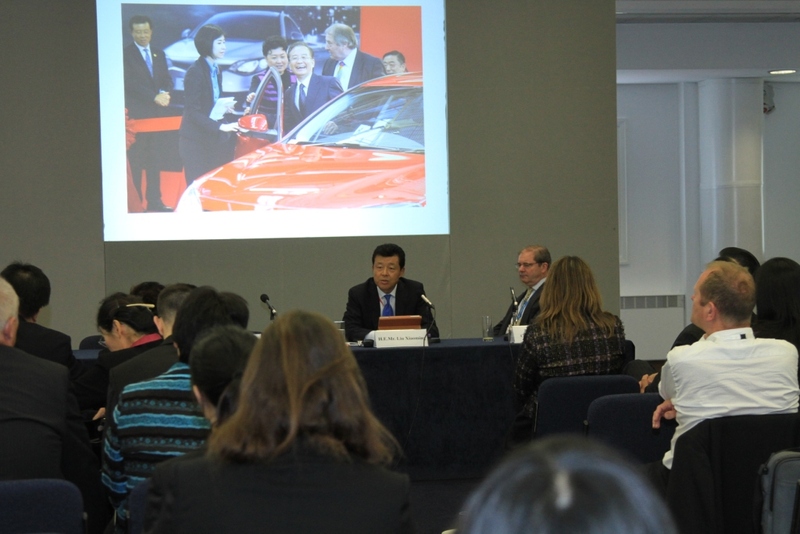 We hope there will be continued support for Chinese companies investing in Britain. · Maintain the non-proliferation regime. · And uphold world peace and stability. The global financial crisis is now in its third year. We should intensify macro-economic policy consultation and push for reform in the international monetary and financial architectures. Efforts should also be made to advance the WTO Doha round negotiation. China and Britain should also work hard to oppose trade protectionism and contribute to world economic recovery and growth. Second, respect each other and appropriately manage differences. China and Britain have different social systems, histories, cultures, values and paths of development. 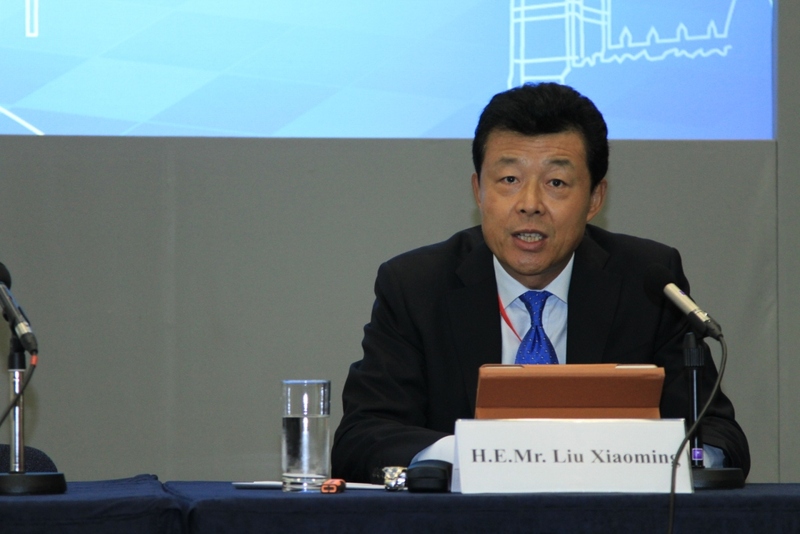 In China we very much believe that there is no 'one-size-fits-all' model for all societies. A social system should not to be judged by whether it's 'eastern' or 'western.' The central yardstick should be whether it contributes to national development, public well-being and has the widest possible public support. On all these counts, China's development path has been proven to be an effective way to success. To achieve harmony, the best way is to respect diversity. Trying to lecture and impose one's own will on others can only backfire. A better approach is to respect, accommodate and learn from each other. Countries should seek wider consensus and not allow differences to stand in the way of cooperation. 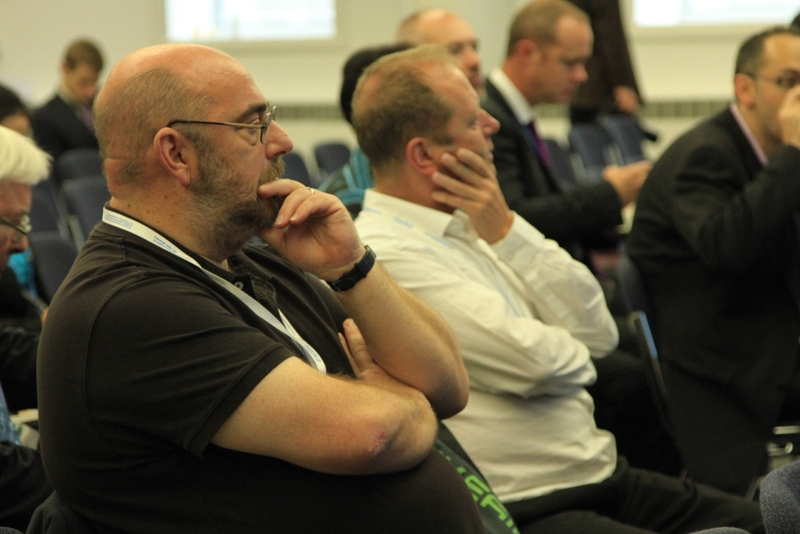 Third, increase people-to-people exchanges and shape more positive public opinions. I arrived in London one year ago. Since then I have felt a lack of understanding of today's China among the British people. There is a very real gap between the perceived impressions of China and the reality of what my country is today. The evidence of this lack of fair reporting by British media can be found by talking to British visitors returning from China. Many British friends found that the China they observed and experienced is quite different from how it's characterised in press coverage in Britain. We must not forget that those with an experience in China are a minority. British visitors to China numbered merely 575,000 in 2010. In contrast US official surveys show that over 3.8 million Britons visited the USA in the same period. Therefore, to encourage a balanced view that sees China as it is, we need to increase people-to-people exchanges. The Chinese and British governments have agreed to set up a people-to-people exchange mechanism. I am glad it will be co-chaired by Secretary Hunt from the British side. The aim of this mechanism is to boost contacts between our people and create stronger popular support for our relationship. At the same time, British media needs to take an objective view of China's progress, and reach out to average Chinese and listen to what they have to say. The key is to help British people develop a deeper understanding of China's vibrant society and its pursuit of peace and development. 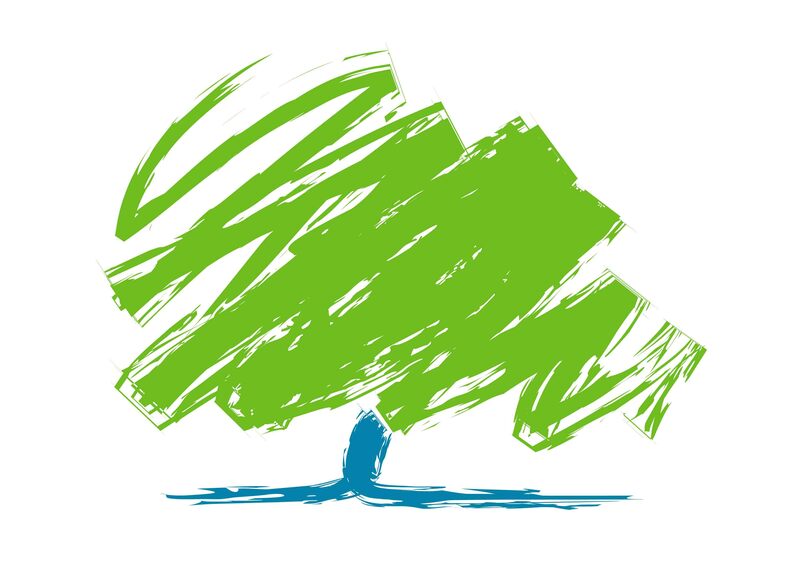 Now, turning to something you know so well - the logo of the Conservative Party. The simple green and blue oak tree design reminds me of the symbolism of the oak tree, which is one of strength and endurance. For me those two words 'strength' and 'endurance' is the hallmark of the diplomatic ties between our two countries. Next year in 2012 we look forward to celebrating the 40 years of the full diplomatic relationship between our two nations. Today, 40 years on, our relationship is in good shape. Just like your oak tree, our relationship has deep roots and strong branches. It will grow into the equivalent of a giant tree. I have no doubt that our partnership will generate more benefits to the Chinese and British people and to the entire world.